0:10 – During his introduction, the first substantive thing Trump has to say about Palin is that she has an incredible husband. This most likely says a lot about the amount of respect he has for women. 8:00 – Palin regurgitates Trump’s claim that voters should trust him because he’s financing his own campaign and thus won’t be beholden to the interests of donors. Now, the following has been established for months, but apparently still needs repeating: as of the last released reports, Trump’s campaign has cost around $6 million, nearly $2 million of which came from his personal fortune. The vast majority of this money–just about $4 million– has come from about 74,000 “unsolicited donations.” Two other fun facts about Trump’s campaign financing: 1. he spent more than $500,000 on those hats, 2. his coffers, as of the last report, were very low, meaning he’ll either need to sink even more of his personal fortune into this, or accept way more outside donations. As well as being an outright lie—Congressional debates over the Patient Protection and Affordable Care Act, and the Planned Parenthood defunding bills, did not at all play out as Palin claims they did—it’s worth wondering if Palin honestly believes that Republicans in Congress have cooperated with Obama to fund illegal immigration. 12:05 – In a night packed with tortured metaphors, Palin’s claim that other GOP candidates “wear political correctness like a suicide vest” may be the high point. 13:12 – Palin incorrectly implies that the U.S. federal government is bankrupt. This is not the speech’s only instance of this. 16:38 – Palin claims that Trump “spent his life with the workin’ man.” This is an odd thing to say about the son of a wealthy real estate developer who attended private school, most likely dodged the draft, then went to work for his father’s company, in which he got started by revitalizing a Cincinnati apartment complex that his father had bought for him to work on for $5.7 million. 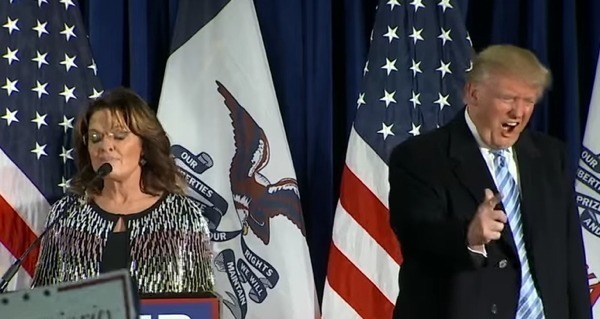 21:06 – As Palin and Trump leave the podium, the mic picks up Trump saying to Palin, “Come on, we’ll sign a couple of things.” That moment, above all, seems indicative of their attitude about all this.